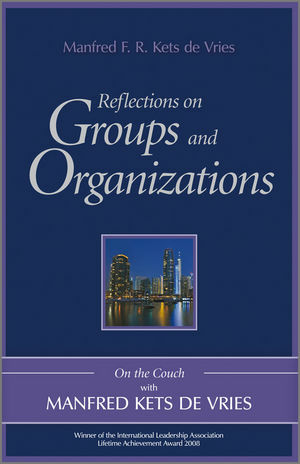 Reflections on Groups and Organizations is the third and final book in the On the Couch with Manfred Kets de Vries series. Broadening the Kets De Vries canvas, this book examines concepts of organizational health, performance, and change. Material ranges from studies of high performance teams – based on time the author spent with the pygmies of central Africa – to the study of organizational stars, to the use of coaching interventions to improve personal and organizational functioning. Kets de Vries looks at the interpersonal and group processes that determine how organizations work within specific contexts, including family firms. He studies dysfunctional leader-follower relationships, downsizing, and organizational transformation. Kets de Vries also introduces his concept of the "authentizotic" organization – a pleasant, healthy, well-functioning workplace. Manfred Kets de Vries brings a much-needed fresh perspective to the subjects of leadership and change, drawing on his knowledge of economics, management, psychology and psychoanalysis. He is Clinical Professor of Leadership at INSEAD where he holds the Raoul de Vitry d’Avaucourt Chair of Leadership Development. He is also a Visiting Distinguished Professor at the European School of Management and Technology, (ESMT), Berlin. In addition, he has held professorships at McGill University, the Ecole des Haute Etudes Commerciales in Montreal, and Harvard Business School, and has lectured at management institutions all over the world. He is the author, co-author, or editor of more than 35 books, including The Leader on the Couch and Family Business on the Couch, and over 300 articles and papers. The Financial Times, Le Capital, Wirstschaftwoche, and The Economist have judged Manfred Kets de Vries one of the world’s leading thinkers on leadership. In 2008, he was honored with the Lifetime Achievement Award from the International Leadership Association as a "founding professional of the development of leadership as a field and as a discipline." Previously, in 2005, he was the first non-American recipient of the ILA Leadership Award for his "contributions to the classroom and the boardroom." In 2010, the Dutch Psychoanalytic Institute presented Manfred Kets de Vries with the Freud Memorial Award in acknowledgment of his exceptional work on the interface between psychoanalysis and organizations.